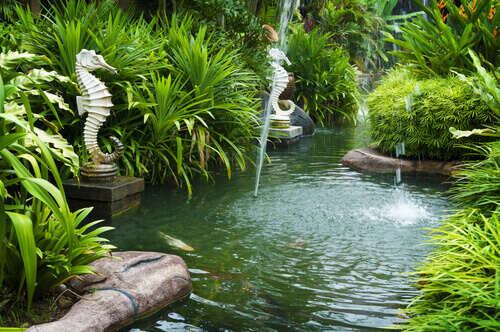 Water features are growing in popularity among many homeowners, and there are a number of benefits you can gain by adding them. They are beautiful, will put you in touch with nature, and are both rewarding and challenging to build. Below are some key benefits that you’ll gain by adding one to your home. Many homeowners realize that remodeling a kitchen or bathroom can dramatically increase the value of their property. The same is also true for a water garden. A homeowner that installs it, especially one designed by a professional or famous designer, will have a property value that is much higher than a home that lacks such a feature. Water features that are well designed and maintained well make the home more attractive to buyers if and when you decide to sell. The most spectacular water gardens are those which are simple yet elegant. Creating such a feature requires a professional touch, as the designer must position the objects in a way where they feel as though they are an integral part of the landscape. A well designed water feature will also be low maintenance, as many homeowners today are busy and don’t have the time or desire to do a bunch of manual work themselves. Research indicates that being in the presence of water, particularly water that is moving, can significantly lower your stress levels. Spending even a few minutes in a quiet, peaceful water garden can be a great way to unwind after a long, tough day at work or school. When water evaporates it creates negative ions which are tasteless and invisible to the eye. These ions have been noted to increase the mood of those who are exposed to them while reducing stress hormones. Have you ever wondered why so people go to the beach, rivers or lakes to unwind and relax? It clearly has something to do with the presence of moving water, and incorporating a water garden into your home is the perfect way to recreate this effect, albeit on a smaller scale. Water is the essence of life. Noise pollution is a growing problem in urban and even some suburban areas. Many white noise machines utilize ocean or water sounds because they are not only soothing, but can also drown out undesirable background noise. If you’re tired of hearing noisy neighbors or traffic a water feature can be the perfect remedy to reduce or even eliminate the noise completely. As you can see, a water feature that is well designed will bring numerous benefits to your property. However, it is important to make sure it is professionally designed. A professional water feature designer is a true artist and approaches each project with the same zeal and energy as a painter or sculpture. No two projects are unique and when his work is done the result will be a true masterpiece.